In 1980, Bob Stupak, future owner of Vegas World and eventually Stratosphere, owned the Vault casino on Fremont St and wanted to build an iconic marquee. Taking inspiration from Vegas Vic, the idea for Vicki was born. As a compliment to Vic’s mechanical waiving hand, Stupak wanted Vicki’s to do something as well so he had the designers make her leg kick. However only 6 months after she was unveiled, the kicking mechanism in her leg broke. Claiming he didn’t want Vicki to be out of commission for however long it would have taken to repair, the mechanics were never fixed and her leg never kicked again. This last week, Vicki was removed from her home of 37 years so that construction could begin on the former Las Vegas Club. New owners promise Vicki isn’t being retired to the Neon Boneyard and vow she is simply being relocated. However where that will be or when it will happen has not been revealed yet. 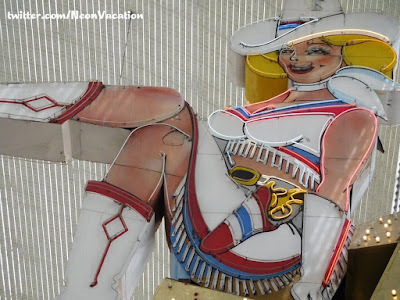 The two most popular rumors are that she’ll be relocated to the northern freeway turnoff to Las Vegas as a bookend to the “Welcome” sign, not that one, or installed on the ground somewhere on Fremont St, making her a photo op for visitors to downtown. 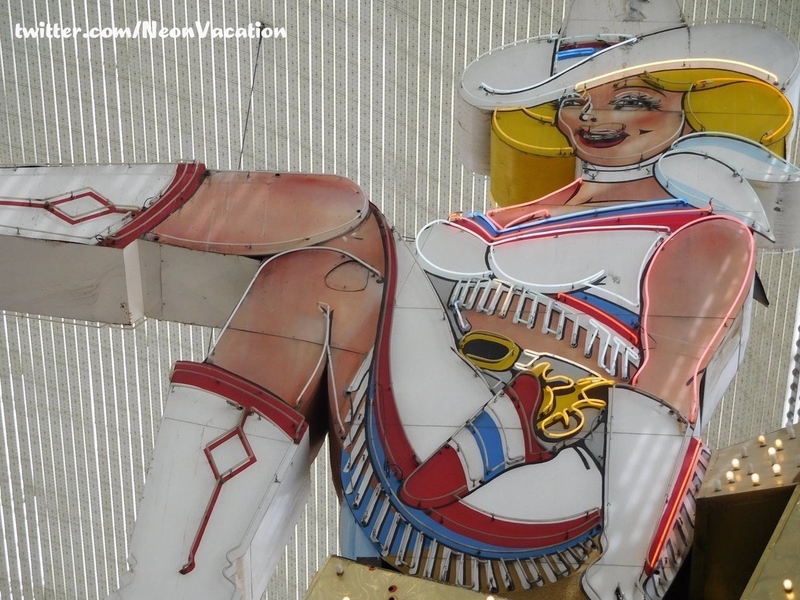 This week’s winner, shared by @NeonVacation may be the best photograph I’ve ever seen taken of Vegas Vicki.